This is a 60 lb. laser printable security paper that provides covert and overt document protection against the threat of forgery and counterfeiting. These are made with an invisible "VOID" pattern printed into the background. 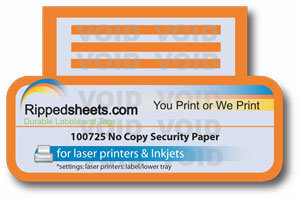 The "VOID" pattern becomes visible on any duplicates that are made from the original on a copier or desktop scanner. However, the "VOID" pattern does not obscure thetext of the original document on the copies. No other pattern except "VOID" is available. 100725 also comes in blue because the darker the color the better the security system works. Also offered is 60 lb. green and pink in minimum quantities of 250 8.5″ × 11" sheets. Uses for 100725 are wide and varied for those institutions who want to secure laser printing of original manuscripts, transcripts, reports, prescriptions, contracts, games, contests, stock certificates, direct mail, checks, forms, legal documents, licenses, coupons, permits, receipts, tickets, awards, gift certificates and passes. 100725-6 Blue (Void when copied) with non-security plain white paper backing. Takes about a week to ship. Not available for online ordering.